This is the only bowling ball test anyone has been able to uncover: a guest on the Dave Letterman show dropping bowling balls five stories onto an old car. Yesterday we heard about the “bowling ball test.” According to Donald Trump, this is how the Japanese keep American cars out of their market: they drop a bowling ball on the hood, and if it makes a dent they refuse to let it in. Today the White House tried to pass this off as a joke, but Trump pretty obviously didn’t mean it as a joke. He believes it, and he’s hardly the only one who believes that Japan deliberately sets up lots of red tape to keep out foreign cars. Perhaps you’d be interested in the truth about this? First off, Japan did keep foreign cars out for several decades after World War II. But that largely ended during the 70s and 80s. There are currently no tariffs on foreign auto imports, and the safety and emissions rules are roughly the same as everywhere else. Japan, like the EU, uses a “type approval” system to clear cars for sale. This means the government certifies that the vehicles meet safety standards. In the United States, though, the automakers certify that their vehicles meet federal safety requirements — and assume the liability of meeting those requirements. During negotiations over the Trans-Pacific Partnership, the Pacific Rim trade deal Mr. Trump abandoned after taking office, Japan agreed to recognize more American auto safety standards and streamline certification procedures for imported vehicles. But now that the United States has pulled out, those concessions are at risk. Refitted with right-hand drive and other changes meant to appeal to the Japanese, the Cavalier wasn’t the first American car to hit the Japanese market when it landed in October 1995, but it was one of the most-hyped ones of that era. The symbolic deal was touted as the wedge that would finally pry open Japan’s “closed” market for American imports. Instead, it largely reinforced Japanese preconceptions about American quality. GM funneled Japan-bound Cavaliers through a special finishing line at its Lordstown, Ohio, plant to ensure extra-rigorous quality. That did not stop Toyota inspectors from rejecting droves of the cars and sending them back for fixes before granting final approval for shipment to Japan. That left a bad taste that’s lasted for decades since. There’s also a problem with right-hand-drive cars: American auto companies don’t make them. European brands advertise aggressively and have done more to customize their products for Japan, for instance by producing right-hand-drive versions of their vehicles — a seemingly obvious selling point, in a country where the driving lane is on the left, that American producers have long been criticized for ignoring. The best-selling American brand in Japan is Jeep, which last year accounted for close to half of all American auto sales there. It offers right-hand-drive vehicles — a legacy of the customized delivery vehicles it once made for the United States Postal Service, which let drivers step out onto American curbs instead of the road. The last time Shujiro Urata wanted to buy a new car in Japan…the dealer and a coworker showed up at Urata’s doorstep an hour later with two demo cars, which Urata and his wife test-drove around the neighborhood. The Uratas decided to buy a car from the dealer. The dealer also handles their car insurance, coming to their home whenever the insurance contract needed to be renewed. The Uratas bring in their car to the dealer every few weeks for a free car wash.
….Japanese customers also expect to receive services like free maintenance from their dealers after they buy their cars, Urata said. When their cars need a checkup, the dealer comes and picks them up, does work on them, and then returns them. American dealers don’t offer such services. “Developing this network is expensive, and maintaining it is expensive, and that’s one reason U.S. car makers decided to withdraw,” he told me. I talked to a Japanese man named Hideo Ohashi, who has only bought Toyotas in Japan. He has considered buying a Mercedes-Benz, he told me, but he worried that it would be too expensive and lengthy to get new parts if his vehicle breaks down. A friend of Ohashi’s has a European car and it takes weeks to get parts from the maker, Ohashi said. Speaking of family, my brother-in-law, freshly married, bought a Mini Countryman, 4WD. He bought it the Japanese way, he specced it at the Mini dealer, the order was placed, and the car is custom-built in Graz, Austria (so much for a British car.) With shipping, it will be delivered in three months. Japanese and European OEMs have been doing mass customization and built-to-order for decades. At the Ford dealer, it’s the American way, you get what’s on the lot, and the steering wheel can be on the wrong side, if you don’t mind. Many Japanese consumers, faced with congested cities, favor tiny domestically-made vehicles, called kei cars, which make up more than a third of the market….Even Japan’s Toyota Motor Corp and Honda Motor Co cannot convince Japanese consumers to buy models that are popular in the United States. Small sport utility vehicles such as the Toyota RAV4 and Honda’s CR-V are seen by Japanese consumers as too big. ….“It would take a painstaking fine-tuning of vehicle specs to suit American cars to those driving and other conditions and develop a strong distribution network to be able to gain traction in Japan. It is nothing short of a 20-year effort,” said a Toyota executive who spoke on condition he not be named. Jaguar Land Rover Japan Ltd Chief Executive Magnus Hansson said the low sales of U.S. cars in Japan did not mean it was a closed market, but rather reflected “a total and absolute lack of effort over 50 years” by Detroit. [Go] on a fact-finding mission to a Ford or Chevrolet dealer in Japan. Within minutes, [you] would condede that they aren’t really trying to sell anything. Detroit has boycotted any Japanese car show since 2008. No advertising. Did I mention a lack of marketing? Are you bored yet? 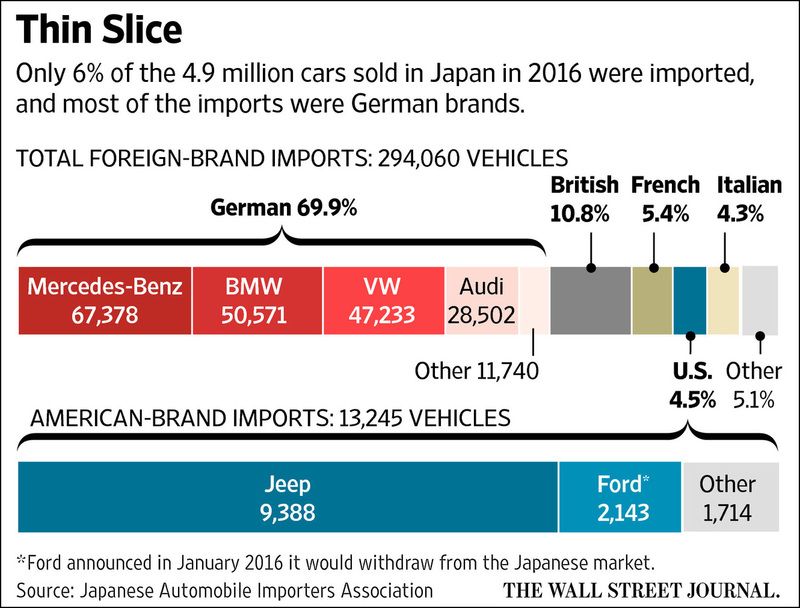 Do you now have an idea of why American companies sell so few cars in Japan. It’s not tariffs, which are zero, and it’s not really non-tariff barriers either. It’s the fact that the Japanese still build more reliable cars; they build smaller cars; they build right-hand-drive cars; they treat their customers better; and they advertise their wares. American auto companies don’t do any of this and have never even tried. Is it any wonder that they don’t sell very many cars there?